JBWEB000069: description JBWEB000124: The requested resource is not available. 15:23:20,038 WARN [org.jboss.as.txn] (ServerService Thread Pool -- 44) JBAS010153: Node identifier property is set to the default value. Please make sure it is unique. 15:23:20,189 INFO [org.jboss.as.clustering.infinispan] (ServerService Thread Pool -- 29) JBAS010280: Activating Infinispan subsystem. 15:23:32,734 ERROR [org.jboss.msc.service.fail] (MSC service thread 1-7) MSC000001: Failed to start service jboss.deployment.unit. 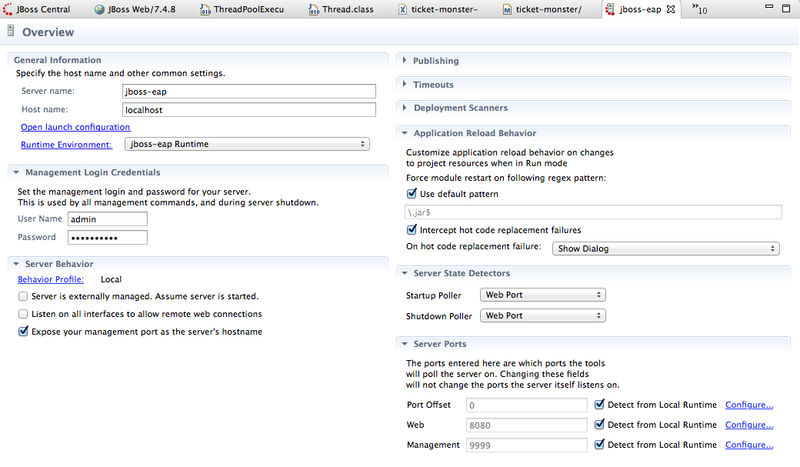 "ticket-monster.war".DEPENDENCIES: org.jboss.msc.service.StartException in service jboss.deployment.unit. "ticket-monster.war".DEPENDENCIES: JBAS018733: Failed to process phase DEPENDENCIES of deployment "ticket-monster.war"
Caused by: java.lang.IllegalArgumentException: JBAS011470: Persistence unitName was not specified and there are 2 persistence unit definitions in application deployment deployment "ticket-monster.war". Either change the application deployment to have only one persistence unit definition or specify the unitName for each reference to a persistence unit. JBAS014777: Services which failed to start: service jboss.deployment.unit. 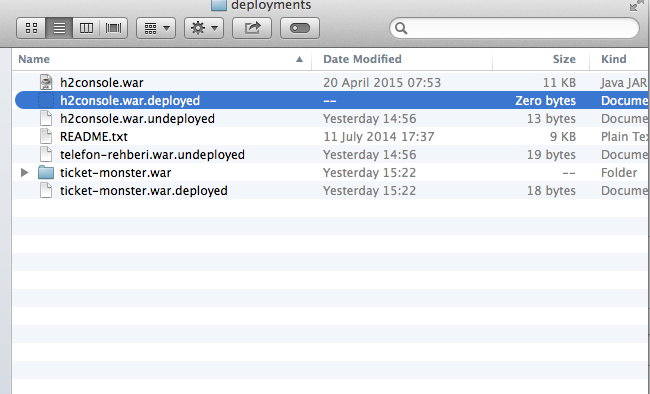 "ticket-monster.war".DEPENDENCIES: org.jboss.msc.service.StartException in service jboss.deployment.unit. "ticket-monster.war".DEPENDENCIES: JBAS018733: Failed to process phase DEPENDENCIES of deployment "ticket-monster.war"
And here is the overview of the jboss-eap server.. It didn't have any problems by the end of the first tutorial..